There was one little incident of note that is worth sharing with you here. The business of “surrender” is something that I know a lot of people struggle with. In an ideal world, we would all love to surrender unconditionally to the Divine, and just lay back and bask in all the rewards. But in practise, it’s quite difficult. However, during my visit to Sai in 2010, I experienced first hand that when you surrender to God, nothing can harm you. Every day after darshan, devotees, if they wish, can pass through the Mandir. It’s one of those things about Prashanthi that can be quite frustrating, because on one hand, it is an amazing experience to behold the interior of the temple. But on the other hand, you are ushered through so quickly by the seva dals that you don’t even have time to blink. The knack is to understand that all is just Swami’s play, and as grand as the inner temple is, it is only matter and will one day exist in a different form; also, it helps to remind ourselves that all frustrations are simply egoic and the result of thwarted desires. So, the protocol is that after darshan, those wishing to file through the temple form an “orderly” queue starting from the front of the dais. At some point the seva dals give the signal to move, and devotees step up onto the dais and file through the temple and out again. On this particular day the crowds were so vast that I didn’t even think about trying to get close to Swami, I just sat somewhere towards the back of the hall where I could be as comfortable as possible. After darshan I continued to sit and soak up the God-man’s vibrations. As I did so the queue for the temple had grown so long due to the hoards, that it was now continuing to form where I was sitting and further on towards the back. I just sat there with my eyes closed basking in Swami’s love as chaos ensued around me. I was then aware of people falling on top of me. I felt that basking in Swami’s love was more important than avoiding being crushed, and decided that I would just surrender myself to him. At that point I felt myself sliding along the concrete floor. I opened my eyes to see an Indian man with a look of horror on his face as he held my arm. He’d seen the people falling on me and dragged me away. He’d leapt into action; rather like Superman, the only difference was that he wasn’t wearing his underpants outside his trousers. I smiled and thanked him; it was a very smooth ride. Stephen Turoff in the waiting room at his clinic in Chelmsford. It had taken me an absolute age to finish the Tara Ward book about discovering your psychic powers, but now that I had, I could start the book by Grant Soloman on the life of world-famous psychic surgeon, Stephen Turoff. The book was amazing, and not only did I learn about all the incredible healing miracles performed by Stephen, but I also learned that Stephen was a devotee of Sai Baba, so the book gave me further insight into the fuzzy-haired Indian God-man. Towards the end of the book, the author wrote about how he was sitting in his office in the UK one day and glanced up, only to see Sai Baba walk past the window. He knew that Swami was thousands of miles away in India, so this gave me further insight into Baba’s ability to be in several places at once. I started to seek out books on Swami so I could learn more, and at some point Swami started to appear in my dreams. I was still living above the hairdressers at this point, and when I felt the burning sensation in my stomach, I decided that I was going to go to Stephen Turoff’s healing clinic in Chelmsford. My mum and my friend Sue came with me. We drove down in my car the day before our appointments were scheduled and stayed in a bed and breakfast place in Little Beddow, a short drive from Stephen’s clinic. It was quite an experience just sitting in the waiting room. The walls were adorned with photos of Sai Baba and various other holy men. Vibhuti had manifested itself in several places in the room. At one end was a kind of altar and in a corner was a small chair with one of Swami’s robes draped over it. Vibhuti had also formed on the robe. Before we were called in I had a very profound experience, which I wrote about in my book, The Amazing Journey. I went into an involuntary state of meditation, during which I heard what I can only describe as a “God Voice”, in my head. The voice was so incredibly sweet that words cannot describe it. Because of my heightened state of awareness at the time I cannot remember what was said. All I remember is that the voice sounded like that of a father speaking to a son that he loves dearly. The experience in the clinic room was also incredible. Stephen actually had two small clinic rooms side by side, and he would simply move from one to the other performing spiritual operations. The operations usually only lasted a couple of minutes at the most, so it was like a production line; one in, one out and so on. We all went in together and I volunteered to go first. Stephen was a huge man; a gentle giant, and he’d once been a bouncer on the door at the Tottenham Royal, which was a dance hall in Tottenham, North London, not far from where I was born. I lay on the couch and Stephen asked me what the problem was. I told him, and he wasn’t very happy that I had not gone to see my GP for a diagnosis. However, he put his hands on my stomach and I chose not to watch. He seemed to fiddle around and then reach for something, then I felt as though one side of my stomach was being kneaded. It didn’t hurt but it felt very uncomfortable. He then seem to make a throwing action and there was a dull thud in the waste bin as though something had been thrown in it. That was that. He then went into the next room to perform another op, then he came back and worked on Sue. Then he disappeared again and then came back and worked on my mum. When we were all done, there was one hilarious moment when this huge man had my tiny mother sitting on his lap. It was very funny and just the right way to finish the whole experience off. After we left the clinic room Sue said to me, “did you know that he’d taken a scalpel to you”?. I said, “yes, I had an idea that he’d done that”. She then said, “Were you aware that he’d removed something from you and thrown it in the bin”? I said, “yes, but I didn’t bother to check the bin to see what it was”. Sue said, “I was curious, so I had a look in the bin on the way out, and it was empty”! Incredible! I seem to remember that he took a scalpel to Sue as well but I can’t remember if he did to my mum. Unbelievably, there was no anaesthetic used, there was no blood, no pain (only a few moments discomfort), and no scars afterwards. The next time I meditated after that it was like no other meditation I’d had up to then. My chakras seemed to explode open and it was yet another step forward in becoming the new me. From this point on I made a concerted effort to cut down on my drinking and I have not touched any spirits (no pun intended) since that Christmas in 2000. I think if I carry on up to the end of 2003 this post will be far too long, so I’m going to stop here; but while I feel like I’m on a roll I’m going to get straight on with the next part. I had an amazing experience this morning that ended at approximately 06.40. It was so amazing, in fact, that as I sit here typing a little over four hours later, I am still trying to get my head around the whole business. 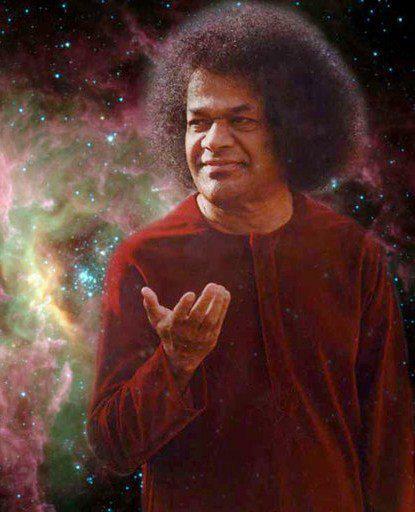 I have had Sai dreams before, but I can honestly say that this experience was on a par with the time Sri Sathya Sai Baba plucked me from my physical body and carried me away on an astral journey back in December 2006. Strangely enough some details of the dream are very vague, especially the early stages. But the main content remains very vivid in my mind. Because of the vagaries of the early part of the dream I will start this account by relating what my heart is telling me occurred. I was in a room that seemed quite small and I cannot remember the decor, but I must have been craving for Swami’s presence. I vaguely remember calling out for him and then being raised up fairly high off the floor and finding myself facing a picture of him that was on one of the walls. I became very excited about seeing Baba and even though the picture looked a bit un-Baba-like it was most definitely the God-man; with his orange robe and shock of black fuzzy hair. His face was kind of different but his eyes were so real. I do remember talking to him in a very enthusiastic way, when I look back now it was as though somewhere within me, at a very deep level, I knew he was coming. but within seconds my experience was over. Now this is the bit that I remember very clearly. I was not happy with my experience being so short, but not in a negative way, and I started calling once again for Baba. I must have been calling with such enthusiasm because all of a sudden Swami was there. He was laying on a bed asleep and I appeared to be looking down at him. I enthused “wake up Swami, wake up!” He opened his eyes and within a split second we were standing face to face. We were so close you could have barely got a cigarette paper in between us. I did something next that under normal circumstances you would never do to an Avatar; I grabbed his right arm with my left hand as we faced each other. It was done in a nice way of course; I was so full of excitement. I said “I’ve been missing you” and “speak to me Swami, speak to me”, but Baba just looked at me deadpan. There was a great feeling of friendship between us that I could feel inside me, and I said to him “what’s up, cat got your tongue?” I seem to remember saying “cat got your tongue” to him again and this time he gave that little Swami half-smile; like a cross between a smirk and an impish grin. Then he started speaking to me but I could only hear jumbled sounds coming out of his mouth that seemed distant and I was straining to try to understand him. It was almost like a jumbled radio broadcast, but right in the middle of the “noise” I made out the words “try not to worry so much”. The look on his face was the look of a loving father, mother, sister, brother and friend all rolled into one. He was as solid as solid can be and his form reminded me of how he looked back in the 1990’s. There was signs that he was beginning to age but he had this fantastic youthfulness about him. What was really apparent was that the whole experience was just so natural; a bit like making a cup of tea, it was almost as though it was expected that two friends would meet up and share a few moments of pure undiluted love. He was so non-judgemental; accepting me exactly as I am in spite of all my little faults; and the love between us was beyond mere words. Then it was all over….. I suppose I should now say “and then I woke up”, but it wasn’t quite like that. It’s true to say that when the whole experience began it was most definitely a dream and I was certainly asleep. But as Swami was interacting with me I was wide awake, I simply had my eyes closed; so the whole episode was played out on the inner plane. When Baba had gone I just lay there in bed with my eyes closed; only opening them to look at the clock. When I did look at the clock it said 06.45, so I am guessing that I was laying there for at least five minutes before looking. What I found unusual was that I said to Swami “I have been missing you”. That is not an expression I would normally use; I would normally say something like “I miss you”, I missed you” or “you have been missed”. I believe there are a number of deeper, hidden messages in here for me to unravel, and I may share them in a future post if it seems appropriate. Finally, there was one particular detail about Baba’s physical form that I will not share because I believe it to be very personal between Swami and I. But the reason for mentioning it is that Swami always works in ways that are very precise and literally everything with him has a meaning of sorts. I believe he gave that tiny bit of detail as a gentle reminder to me not to get attached to the form. I believe he came to me in that way because that is how I relate to him. But at the same time he did not want to divert my attention too far away from the “formless”, so he gave me a little reminder that the physical body will deteriorate over time. Oh what an experience! How truly blessed I am! Thank you so much Baba!